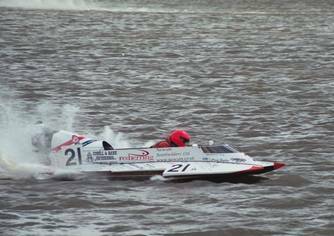 When ’21’ entered the water for the first time, it was known that testing would show a need for modification and that there was very little test time available before the World Championship. The new hydroplane incorporated a number of new ideas which had not been tested before on other hulls. In the first outings, the hydroplane proved to have a high speed potential but modifications and tuning would be required to exploit that potential. Initially the weakness was a result of the craft coming too far out of the water which cut the supply of cooling water to the engine, raising the bore temperature to critical levels. Various settings were tried for the engine in an attempt to resolve the overheating problem but without losing thrust in other sections of the speed range. It was an advantage that the Stage 2 competition for the British Nationals took place in foul weather with continuous rain and low temperatures. Even so, practice laps saw the engine ‘nip’, requiring a strip down and re-assembly, but it did allow Craig to achieve the fastest practice lap and achieve pole position for the heats. A combination of some very smart work on rebuilding the engine, and the unusually low temperatures allowed Craig to push the hydroplane and dominate all heats for Stage 2. It was clear that there was a problem to solve in very little test time. Video of ’21’ showed that the prop was not making adequate contact coming down the straights. Lowering the engine on the transom improved running on the straights but placed the prop too low in the water on the turns. Finally it was decided to try a fairing ahead of the engine and adjustable aerofoil trim tabs. The fairing seemed to help resolve the problems, although the aerofoils were less successful, the main difficulty being in getting the setting right and locking them in position before the hydroplane raced. The result of these trials was the configuration used for the World Championship. Unfortunately, the fairing produced too much down thrust in the conditions applying at Oulton Broad. Craig had to struggle to get adequate performance. Adjustment of the engine position between laps took the performance up and, by the final lap, which was terminated early, ’21’ was showing a significant improvement, if too late for Craig in the Championship.